Welcome to the April 2019 edition of KHBZine. Kit home delivery can be a very stressful time, after an eternity spent on development apps and getting the site and foundations ready. But there is nothing to be concerned about as long as a you understand you are in complete control. Just keep in touch with the provider and give notice of when you require each delivery: you will have to pay before it is dispatched. Check the inventory carefully as it is unloaded and watch for damaged items. The kit is assembled in a factory and stacked into transportable piles. They try to put them in an order, but that doesn't always translate on site as you may want to start in another corner. However, some suppliers may help if you have an idea which corner you want to begin. The complete frame is the first delivery and comes on a semi-trailor with its own crane. Each mini-pack has hoist lifting straps already attached so the crane can quickly lift them off. 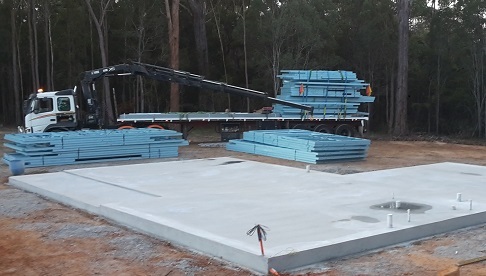 Tips: Make sure there is a way for the truck to drive on and off the property, and can position itself on level ground within 10 metres of your slab/piers. 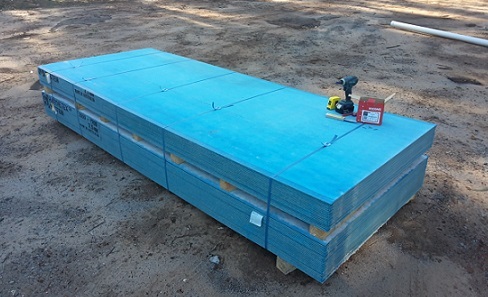 Getting the operator to drop the frames right beside the slab makes it very easy to slide each frame over onto it. It arrives with foundation fixings, frame tensioners, all tie downs and hex screws. 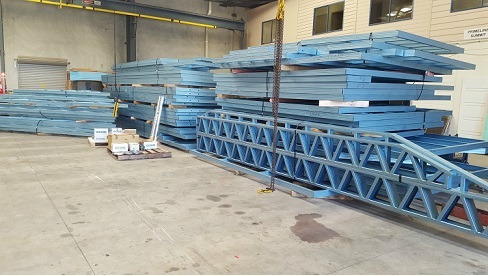 The second delivery is the roofing materials including iron, guttering and assembly parts, insulation, roof battens, screws and rivets. These will arrive on a rather long flat bed truck, with its own crane. Long, because the gutters and battens are cut in 6 metre lengths. Have a very flat area ready for this delivery and they shouldn't be twisted. The third delivery will be the windows and sliding doors. 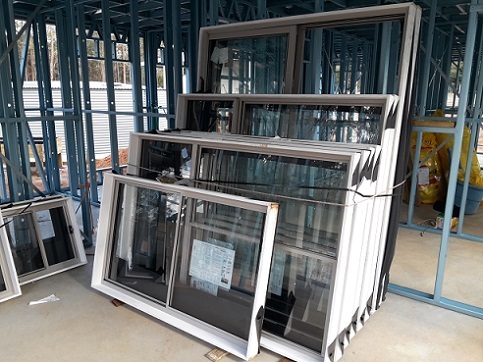 These come with pre-installed reveals and will be stacked, upright in a room of your framed and roofed kit home. All are marked for ID. Tip: tie them to an internal frame as a brisk wind through the unclad house will easily tip them. 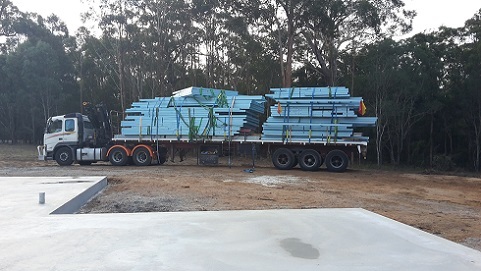 The fourth delivery will be the cladding. In my case it was a stack of blueboard, fixing screws, corner liners, sealant, as well as all soffit boards and edgings. Keep the blueboard dry as it gets heavy when wet and is slow to dry. The fifth delivery is the doors, external pre-hung, and internal (semi) pre-hung. Also delivered are the door stiles and jambs, door furniture and wardrobe shelving. This delivery has to come before the linings as the external doors are part of the 'lockup'. So get them placed in a dry place, such as your shed, outside the house, as the plasterers will not be happy walking around or on these items. 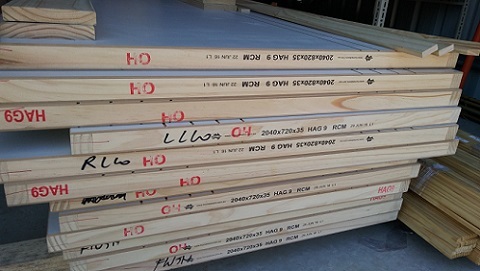 The sixth delivery should be the internal linings which will be delivered 'into' your roofed and clad kit home. 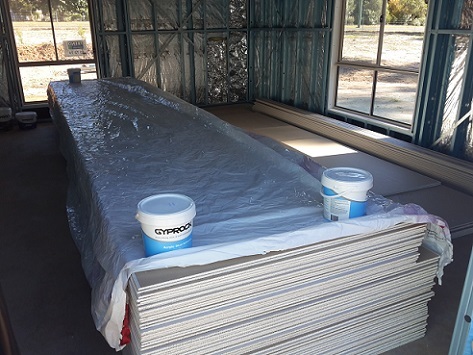 Yes, stand back and watch them professionally bring in the very long (up to 6 metres) wall, ceiling and wet area boards and stack them neatly in your lounge room. They will also deliver all fixings: corners, cornices, glues, screws, and plaster mix. Have a plastic or canvas cover for the boards. The seventh and last delivery is the skirts and architraves. Try to get them delivered indoors if possible. Download your free PDF version HERE and use your personal password khb4269 (lower case letters-expires in 7 days). If you miss out just contact me. 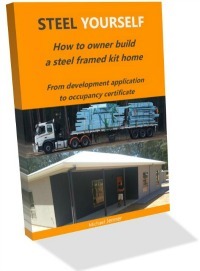 If you have any questions, have an article or submission, or would like to comment or on or review a kit home, provider or design, or suggest a subject for this newsletter, please contact me, I'm happy to publish your submissions, reviews and experiences about kit home building and the projects surrounding them.